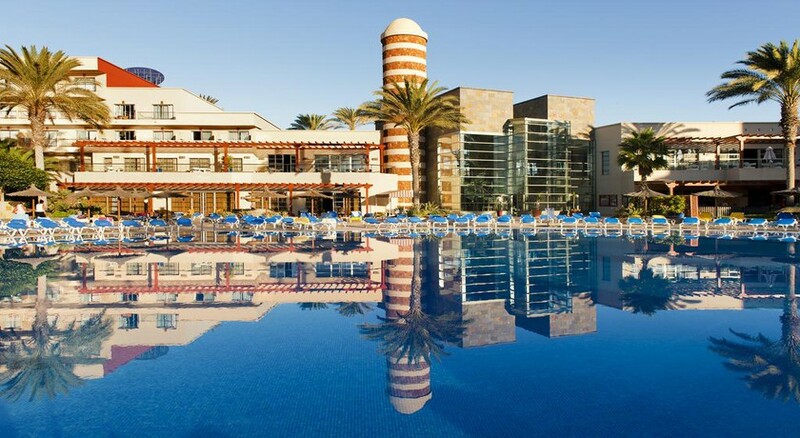 Beautifully situated at the foot of the beach in Fuerteventura’s colourful resort of Caleta de Fuste, the Elba Carlota Beach and Convention Resort is a four-star hotel ideal for families and couples. Featuring well-appointed rooms overlooking the sparkling sea, Elba Carlota Beach and Convention Resort is an excellent choice for relaxing holidays in the Canaries. 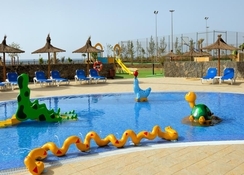 The resort is equipped with amenities such as two large outdoor pools for adults and children, fitness centre, Jacuzzi, kids’ club, children’s playground, sports facilities, free parking, evening entertainment with a mini-disco and live performances, plus plenty of daytime activities for all ages. The hotel also offers two restaurants with buffet and a la carte menus, as well as a terrace snack bar with amazing sea views. 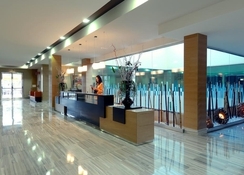 The hotel’s convenient location makes it within easy reach to a number of attractions, including a spa, casino, convention centre, golf course, shopping centre, restaurants and bars. 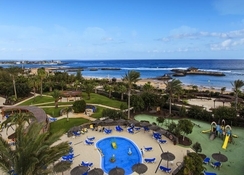 Elba Carlota Beach and Convention Resort is just a 2-minute walk (50m) from the sunny sands of Fuerteventura's glorious coastline. It is surrounded by a number of attractions that offer direct/preferential access to its guests, such as Gran Casino Antigua and Thalasso Spa. The 18-hole Fuerteventura Golf Club is a few metres from the hotel, and a selection of bars, restaurants and shops are also in the vicinity, including the beachfront restaurant and bar Chiringuito La Isla and the Atlántico Fuerteventura Shopping Centre. The hotel’s beachside location facilitates outdoor activities like mountain biking, hiking, windsurfing, snorkelling, kite boarding and fishing. 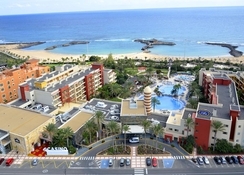 The Fuerteventura airport is around 8.6 km away from the hotel. All guestrooms at Elba Carlota Beach and Convention Resort are spacious, bright and breezy with private terrace or balcony. They are divided into the following categories – Double Room, Double Room with Lateral Sea View, Junior Suite, Family Room, Family Room with Lateral Sea View and Suite Room. Some rooms offer marvellous views of the sea, while each room comes fitted with standard four-star amenities that include air conditioning, mini-bar, telephone, coffee and tea facilities, balcony/terrace, LED TV with satellite connection, safe deposit, desk and fully equipped private bathroom with shower. The suites are ideal for a luxurious stay and are complete with a comfortable bedroom and a separated living room. 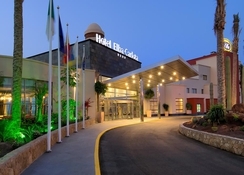 The Elba Carlota Beach and Convention Resort houses two restaurants and a poolside snack bar. There’s also a bar and cafe in the hotel lobby. The buffet restaurant Tindaya serves breakfast, lunch and dinner buffets. The breakfast has traditional food from the Canary Islands and a selection of fruits, cereals, cured meats, breads, pastries and juices, which can be enjoyed on a terrace accompanied with amazing sea views. Lunch and dinner focus on daily changing themes (Italian, Spanish etc.) and also have dishes especially for children. Guests can savour fish, meat and seafood dishes prepared with a Canarian touch. The Italiano Arrecife (seasonal opening) has a menu of Italian dishes, pasta and pizzas. The Snack Bar Reef, which is set near the pool serves alcoholic drinks, along with snacks and wide-ranging traditional Canarian and international items. The resort has two huge outdoor pools: one for kids and the other for adults. Other leisure and entertainment amenities include Jacuzzi, gym, internet corner, digital library, pool room and souvenir shop. Balinese beds service is offered on the beach. Elba Carlota offers daytime entertainment in the pool area and on the beach, while the Sinatra room is the go-to venue during the evening for live shows, music, dance, magic shows and entertainment for the entire family. The kid’s club initiates programmes such as learning new language, competitions, dances, painting and more. Outside the resort, Gran Casino Antigua offers eight playing tables and 30 slot machines. There’s direct access to the casino from the Elba Carlota. In the neighbouring Sheraton hotel, Thalasso Spa Hespérides provides preferential access to Elba Carlota’s guests and has hydrothermal pool, Roman baths, Finnish sauna, ice room, Jacuzzi and relaxation area. Sports enthusiasts can try the 18-hole Fuerteventura Golf Club, right next to the hotel, while shopaholics can check out the nearby Atlántico Fuerteventura Shopping Centre. 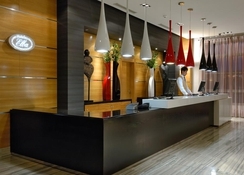 NOTE : Elba Hotels will not accept any unaccompanied minors (an adult is considered to be over the age of 18.) If this clause is not respected, Elba Hotels reserves the right of NOT admission. Great holiday,smooth booking,amazing hotel, food and beach.